Wonder Woman has remained one of the most popular superheroes for decades and is, arguably, the most important female hero in all of comic books. With that popularity, it should come as no surprise that there have been many different Wonder Woman action figure lines reeased since debuting in the 1970s and it shows no signs of stopping now that her cinematic characterization has been unleashed onto the public. We have looked at the broad strokes of Wonder Woman collectibles in our Guide to Collecting Wonder Woman but this guide will focus specifically on Wonder Woman action figures. Shop for Wonder Woman Action Figures on eBay. While this guide is not a full checklist of every single Wonder Woman figure available, it should help narrow the search for aspiring collectors of the Amazon Princess. The guide is separated by the manufacturers that produce the figures as they are commonly synonymous with an era. Use the tabs above to navigate between the major players in the Wonder Woman action figure game. If you're new to the hobby or need a refresher course, be sure to check out our Guide to Collecting Action Figures for key tips and terminology. Click on the images or listings to shop figures on eBay. The first superhero action figures were produced by Mego toys in the early 1970s and while crude by today’s quality standards, set the framework for action figure design and packaging. Quality control or continuity were not the strong suits of Mego Toys and every single figure released has some form of alternatives to collect, whether it be various packaging boxes, costume design, accessories, color templates, face and body molds, or branding. As such, collectors will spend a great deal of time inspecting every aspect of the figure. However, along with these variations and international releases, counterfeits are an issue, so do your research. Wonder Woman is present in several action figure lines released by Mego between 1974 and the company’s eventual demise in the early 1980s. Below is a rundown of the product lines released by Mego that include a Wonder Woman figure. In 1974, two years after the successful launch of the World’s Greatest Super Heroes (WGSH) line of figures, Mego released a four-character line entitled World’s Greatest Super Gals. Billed as the “companions to the heroes,” Wonder Woman was included in this launch. The figures were dressed in a single, silk-screened onesie which, for characters like Batgirl, wasn’t always a bad thing, but since most of Wonder Woman’s design is exposed skin, it can be a very crude-looking figure. This early Wonder Woman action figure stands eight inches tall and originally came in a window box. As a part of this line, she does appear in a blister pack, often referred to as a Kresge Card because of its branded labeling. The figure was also released at least once (in Australia) under the World’s Greatest Super Heroes label following her discontinuation in America. There are dozens of variations with this figure, including packaging, artwork, doll design, accessories, and international releases. Some of the figures were released with plastic, removable shoes while others simply had the shoes silk-screened onto the onesie. 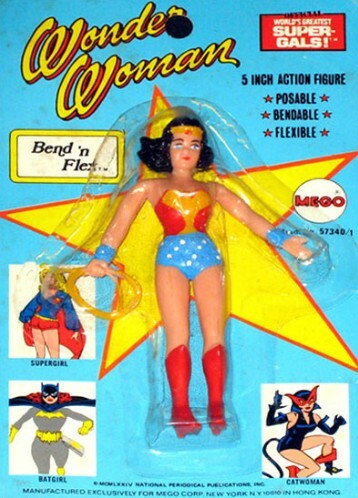 In 1975, Wonder Woman was included in the Mego Bend 'N Flex line which was a five-inch continuation of the WGSH line. These posable figures were made of rubber on a wire frame. By the time Wonder Woman was added to the collection, Mego had settled on a short blister card. These were also the first Mego toys to be released to scale so characters like the Penguin were shorter than the towering superheroes that fought them. Wonder Woman’s later inclusion into this line means there are fewer variations in packaging to track down but it also means a shorter production run. For that reason, this figure is very hard to find MOC. In 1976, Mego decided to broaden their superhero properties in an effort to sell playsets and vehicles and their first 3.75” action figures. Although these look incredibly “cheap” by today’s standards, they wrote the book for future releases with more detailed molds. Wonder Woman was initially released with a face mold that appeared more like Mickey Rourke than Lynda Carter and was quickly replaced with a more feminine mold. These early molds are popular among collectors and can sell for a decent price loose but are very rare MOC. 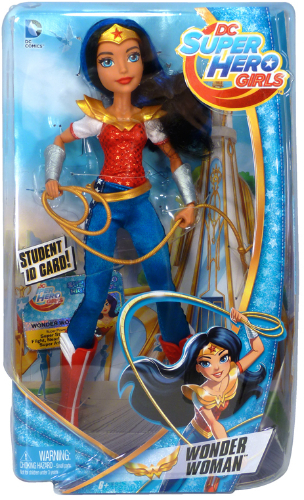 This was also the first figure to include Wonder Woman’s lasso as an accessory which could be held in her right hand. In 1977, after discontinuing Wonder Woman from the WGSH line, Mego released the first figures branded for the Wonder Woman television show starring Lynda Carter. 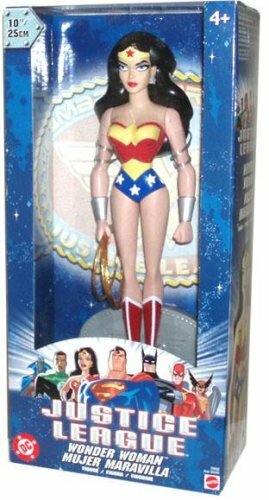 There were several dolls released in this line with Lynda Carter only shown on the first series packaging. Appearing more like a Barbie doll, gone are the days of the silk-screened onesie with exposed “skin” simply being plastic. Early waves of the figure had a painted top with fabric shorts and later waves ditched the painted portion and went with complete fabric costume pieces. 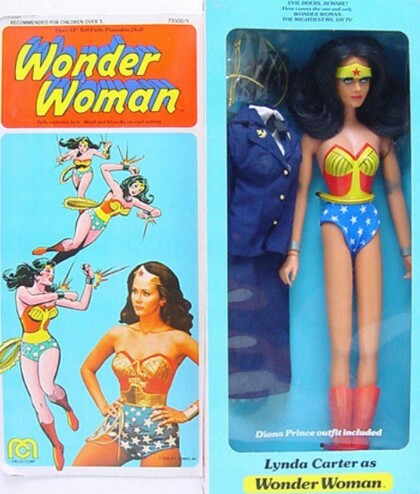 Later waves also included extra outfits for Diana Prince, often borrowed from other toy lines like the Cher doll. Because of the inconsistencies in accessories, it is impossible to determine how many variations there are in total. By the end of the run, Mego was simply throwing in every female outfit from their collection with some releases getting one outfit while others received two or more. In 1979, as a follow up to the Comic Action Heroes line, Mego released Pocket Heroes which were similar to their predecessors but with straight legs. Some of the same molds from Comic Action Heroes were used in this set. Wonder Woman was mixed into the line in 1980 with a new mold that would be used on other figures released by Mego in the following years. VHTF WONDER WOMAN 14" MEGO LTD ED #69178000 FIGURE TARGET EXCLUSIVE NEW MIB! Kenner is probably most popular for their line of action figures devoted to the Star Wars franchise but they also produced one of the most recognized action figure lines for superhero-loving children of the 1980s. The secondary market value for Kenner figures is often the gold standard for action figure collecting because of the legendary characters they have licensed over the years. In 1991, Kenner became a subsidiary of Hasbro, who would end the Kenner brand for good in 2000. The Super Powers line began production in 1984 and it remains popular among collectors to this day with graded MOC figures regularly selling for hundreds of dollars online. 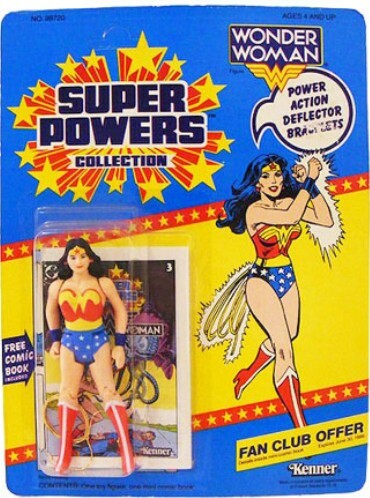 Wonder Woman was part of the 1984 wave 1 launch and was subsequently released in the two waves to follow. Each figure also included a small comic book while cards often featured offers for mail-in goodies such as fan club memberships. The offers on the cards act as a secondary variant so Wonder Woman’s first series release may be listed as a "12 Back Fan Club" or a "12 Back Steppenwolf" (Steppenwolf was a mail-away figure). Beyond those variants, there were also two types of cards for this product line. One wide card had the action figure offset to the side and a slim card showcased a centered figure. Beyond the package variations, there was very little to differentiate the releases. International versions may have a poster instead of a comic and Wonder Woman’s numbering on the checklist can vary from region to region. As the sole female character in this line of toys, Wonder Woman continues to be a sought-after collectible with plenty of options online for adding her to your collection. In 1989, Toy Biz released a line of action figures remarkably similar to the popular Kenner line in both design and packaging. Toy Biz named their line Super Heroes and issued their figures without a comic or poster insert but it was clearly a thinly veiled attempt to capitalize on Kenner's popularity. These figures are typically considered pretty cheap among collectors in terms of quality but they are an important component to any collection. 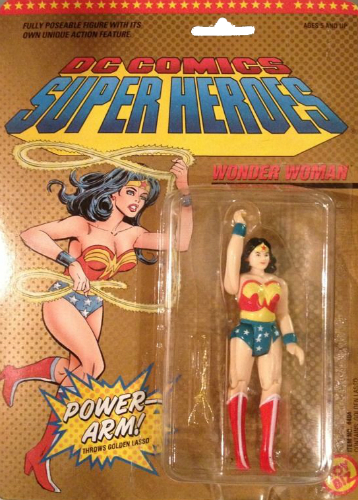 Wonder Woman appears in this product line with a "Power Arm" that can be used in conjunction with her lasso. This was the sole Wonder Woman figure released by Toy Biz and it rarely sells for more than the retail value of a contemporary action figure. KENNER SUPER POWERS WONDER WOMAN w LASSO 1984 DC COMICS SILVER ERA FIGURE !! 1985 Kenner Super Powers Wonder Woman Vintage 23 back Figure RARE! WONDER WOMAN DC COMICS SUPER HEROES 1989 TOY BIZ SEALED Never Opened. Mattel has produced more Wonder Woman action figures than any of the preceding manufacturers and has included the character in many of their product lines. With designs based on comic books, cartoons, and movies, there are many paths a collector could take with this brand. It is not always clear, though, which figures are made by Mattel as quite a few are branded simply to DC Comics. A quick look at the UPC code or at the copyright on the bottom rear of the packaging should indicate that Mattel is the producer. There are dozens of different product lines to choose from and the limitations of toy store shelf space plays a big part in the scarcity or plentifulness of these figures. Older releases, discontinued lines, and retail exclusives are often sold above retail value online but, because you can still find many in retail stores, it is possible to amass an impressive collection very quickly and without breaking your budget. Always remember, the Mego and Kenner toys sold for less than $5 on store shelves so predicting the value of these figures MIB or MOC can be tricky but ultimately worth the risk. Here is a basic list of lines to check out but it is important to note that Wonder Woman appears in virtually every line of DC action heroes, even those devoted solely to other characters like Batman. Twenty waves were released between 2008 and 2012 in this popular line of 6” action figures. Borrowing a concept from Toy Biz, each figure included a piece (an arm or a leg) of a larger figure so folks who bought five or six action figures (depending on the series) could assemble an extra character for free. Wonder Woman was released in wave four packaged with the right leg of a Despero figure and wave 17 packaged with the upper and middle torso of Anti-Monitor. 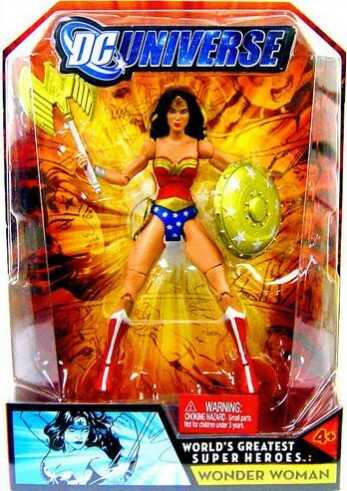 As a part of wave seven, Mattel reissued the World’s Greatest Super Heroes line, including Wonder Woman. There are two different Wonder Woman figures released in the Superhero Girls line. The 12” version is marketed as an action doll while the 6” version is a traditional action figure. While this was originally conceived as a toy line, Mattel has turned this into a multimedia franchise with web cartoons (featuring some pretty well-known voices), a TV movie, books, and graphic novels. Based on the popular television program, this line was produced for several years until its cancelation in 2011. There are several retail exclusive packages, mostly multipacks, such as the Target-exclusive six-pack. The series has also been branded under a few different names. Wonder Woman has figures in waves two and five of the Justice League line, waves one and six in the Justice League Unlimited line, waves two and six of the DC Superheroes: Justice League Unlimited line, and wave two of the DC Universe: Justice League Unlimited series. Each of these featured several multi-pack configurations. Leading up to the release of Batman vs Superman: Dawn of Justice, Mattel flooded retailers with associated action figures. As a critical component to the film, Wonder Woman appears in many iterations under this umbrella line. 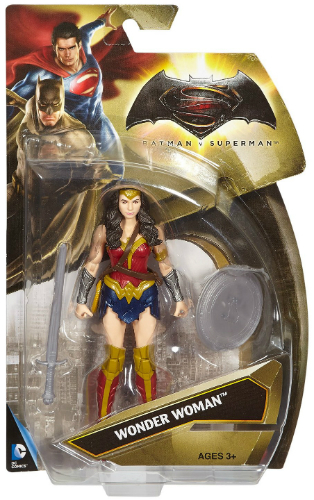 Different versions of the Wonder Woman design are featured in standalone BvS branded boxes as well as incorporated into established lines such as the DC Multiverse line and even Barbie. Mattel DC Comics Multiverse Wonder Woman Menalippe Figure, 6"
Batman Vs Superman Wonder Woman 6"in Action Figure Mattel 2015 "Card Bent"
Interested in digging a little deeper into related topics? Here are some links you should check out.